Home > Shop by Brand > Petit Bateau Clearance > Petit Bateau Unisex Knit Cotton Cardigan in White - size 18m left! Home > 4th of July Baby Clothes > Petit Bateau Unisex Knit Cotton Cardigan in White - size 18m left! Home > Special Occasion Kids Clothes > Petit Bateau Unisex Knit Cotton Cardigan in White - size 18m left! Home > Baby Boy 12-24M > Baby Boy Sweaters Hoodies and Coats > Petit Bateau Unisex Knit Cotton Cardigan in White - size 18m left! Home > Baby Girl 12-24M > Baby Girl Sweaters Jackets and Coats > Petit Bateau Unisex Knit Cotton Cardigan in White - size 18m left! Home > Newborn Baby 0-12M > Petit Bateau Unisex Knit Cotton Cardigan in White - size 18m left! Home > Shop by Brand > Petit Bateau > Petit Bateau Unisex Knit Cotton Cardigan in White - size 18m left! This essential baby cardigan features a pure cotton garter stitch knit and a T-shape design with seamless shoulders for easy dressing. This baby cardigan is the picture of refinement with three little faux-wood buttons. 100% cotton. 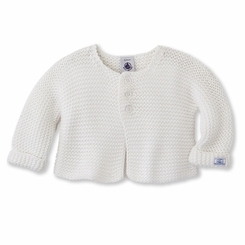 You are currently viewing Petit Bateau Unisex Knit Cotton Cardigan in White - size 18m left!